She walked the power walk that only women who have mastered sloped pavement and four-inch heels can walk. Black cigarette pants and a blazer the hottest shade of hot pink. Her long hair was catching the sunlight and the wind all at once. She was all the things I am not and she was glorious. Neither of us slowed our pace. The whole exchange took less than 30 seconds. I was 21 and adorably naïve, but even I couldn’t get behind this. It didn’t feel authentic. Instead I just chitchatted with anyone and everyone. I drew maps of the French Quarter on napkins and offered tips for cheap restaurants and listened to a whole lot of drunk stories. She grinned and told me she inherited her great hair from her mother in Venezuela. We spent the rest of the ride talking. That single awkward moment on the ferry was the most spiritual part of my whole week. It wasn’t grand or dramatic. It didn’t bring anyone to Jesus. And maybe the shampoo commercial Venezuelan woman didn’t ever think about it again. 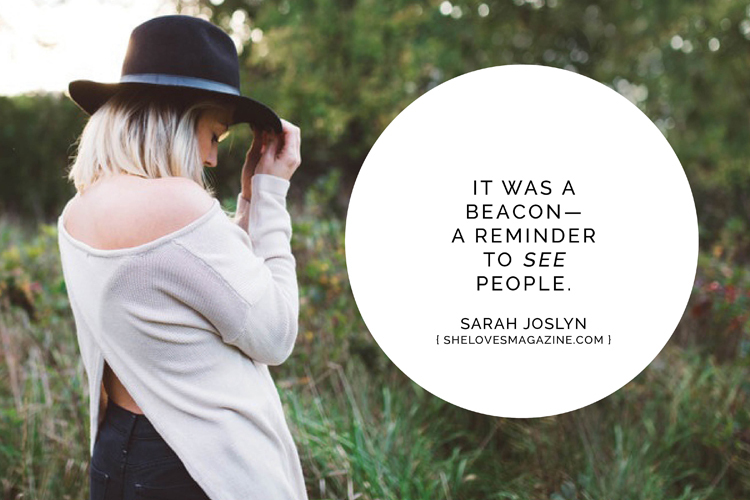 But for me it was a beacon—a reminder to see people. That day I decided I would let more women know the kind and quirky things I think about them. It takes a brave kind of insanity to walk around the world grinning at strangers and telling them their green pants are cool and their big hair is stunning and that they have the kindest smile you have ever seen. But why the heck not? Forget everything you watch on sitcoms. Forget the insecurity of junior high. This idea that women are jealous and unnecessarily competitive is done. We are done with that. There is room for all of us.